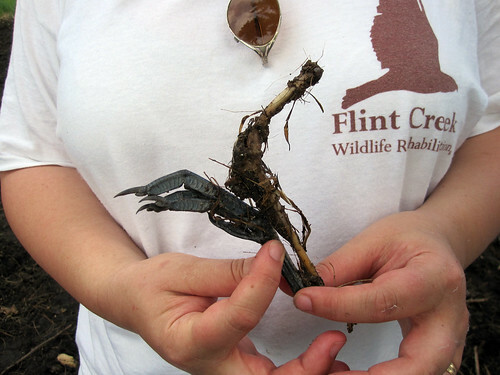 Posts related to Flint Creek Wildlife Rehabilitation. I did the Raptor Internship there in early 2010. Arthur and I paid a short visit to Merritt Island National Wildlife Refuge in mid-September. 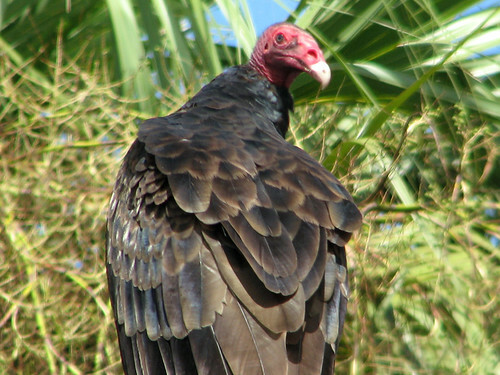 Driving along Biolab Road, we came across several Turkey and Black Vultures loafing on and around the gravel roadway. We slowed down to have a look at this Turkey Vulture perched in a low tree. I love Turkey Vultures. 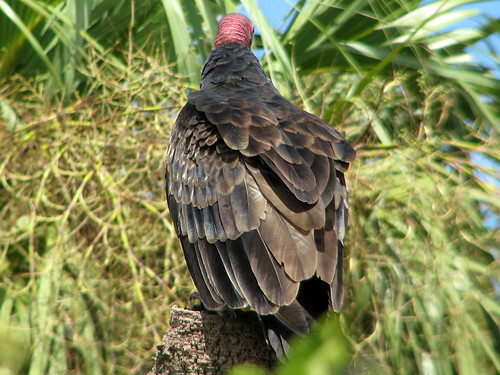 Vultures get a bad rap for their looks and their habits, which is really unfortunate. They are beautiful, big and charismatic birds. I love how they are so social – always soaring together, or sharing a meal in relative peace. 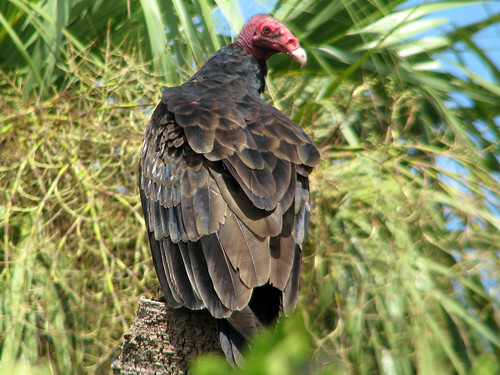 Flint Creek has one magnificent Turkey Vulture among their education birds, a male named Turkey, Jr (or just Junior). I only tried to handle this bird one time, and he apparently didn’t approve of my looks or habits, because he bit me not once but twice (and left a lovely scar on my left hand). I didn’t attempt to handle him again. To my great chagrin, all of the new handlers at Flint Creek – who graduated earlier this year from the Raptor Handler Internship where I assisted – are in love with Junior, and he seems to be in love with them, too. Yes, they handle him with ease and mutual respect. Of course I’m happy for Junior and the volunteers and especially for FCWR. But dang, Junior, what did you have against me?! 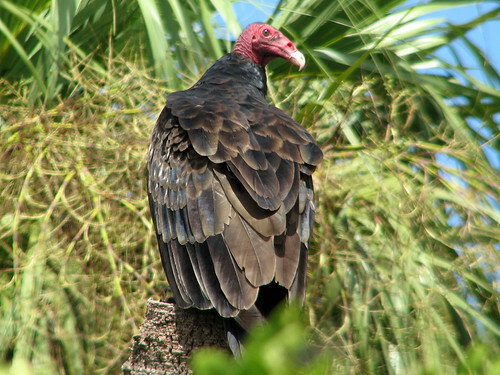 Luckily I can still enjoy Turkey Vultures like this one – from afar. They’ll be with us here in central Florida all year, unlike the northern Illinois birds we only saw during the warmer months. And if they don’t like me, I’ll just get the cold shoulder. No more scars! While Kim, Arthur and I were eaglet-sitting, Dawn and others from FCWR were busy gathering tools and material for a man-made Bald Eagle nest, and arranging for a basket crane in order to reach the height of an eagle’s nest. 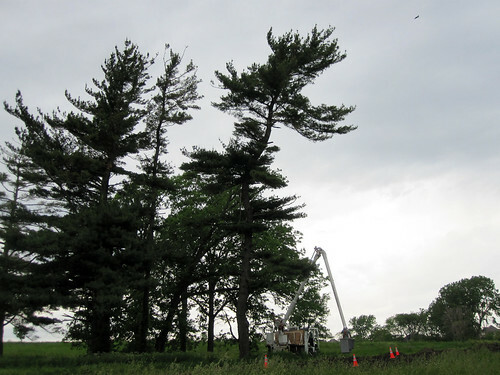 Representatives from The Care Of Trees came out to assess the site and determined that they would be able to access the stand of trees where the eagles had nested. 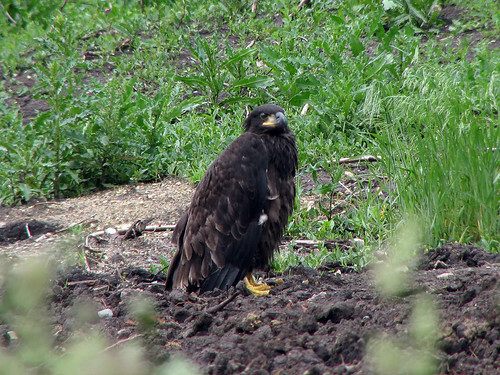 Dawn arrived with the second eaglet and nest-making materials early in the afternoon. 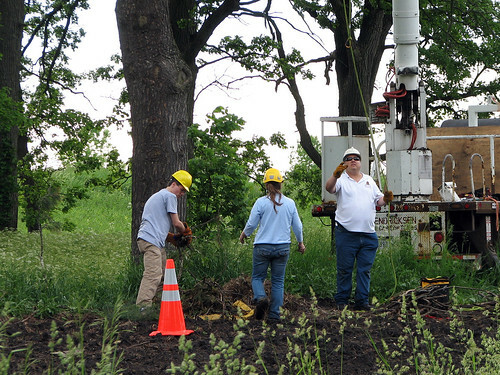 The Care Of Trees was also on site and ready to begin. First, Dawn retrieved the eaglet we had been watching all morning. 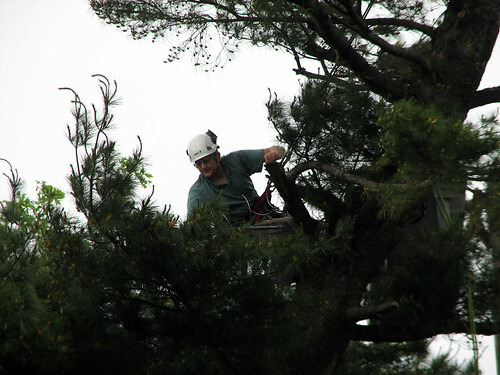 While Brian and Kathy from The Care Of Trees worked to position the crane and ready the tree for the new nest, volunteers worked on creating a large basket-style nest out of hardware cloth and stainless steel conduit. 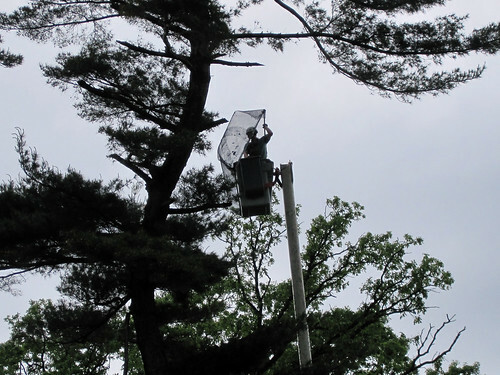 The completed nest was placed about 60 feet above the ground, which represented the practical limit of the crane. The original nest was thought to sit over 80 feet off the ground. 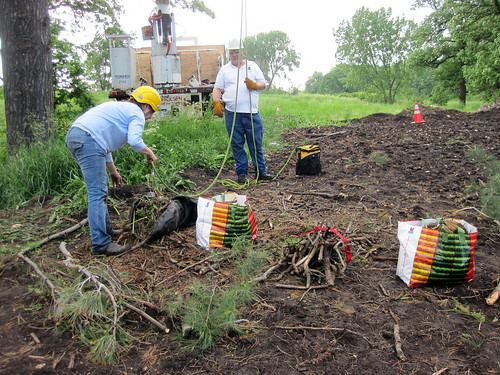 With the basis for the nest in place, volunteers gathered material from the original nest and hoisted it up to the top of the crane. There, Brian arranged the material around the nest basket. It was hot, dirty and time-consuming work. The nest, made of pine branches and other material, smelled wonderful! While gathering up the sticks and soft lining material, we came across the remains of some prey items. There were feathers in the nest, some of which may have been from prey species. One neat thing we found was a turtle shell. We also found a heron leg and some large fish bones. All the while, photographers and reporters from several press outfits were on site to document the work. There are some links to their stories and photos at the end of this post. Representatives from Mooseheart and a small group of concerned Bald Eagle fans were also in attendance for much of the day. At one point, a news helicopter was even circling overhead! At about 6pm the nest was filled with as much material as we could gather and hoist up. Dawn went up in the crane to check the nest before returning to place the two eaglets into the nest. And then it was time to place the eaglets in their new home! As the parent eagles had been seen in the area all afternoon, we all had high hopes for the parents accepting the new nest and resuming their parental duties. Once the eaglets were in place, most of the press people left, along with Mooseheart representatives, local eagle fans, and other observers. 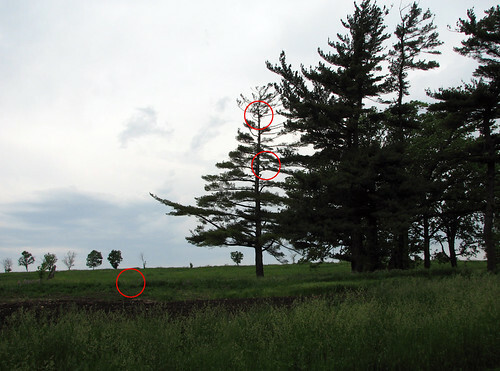 Five of us from FCWR remained to watch the activity by the nest from a removed location for a little while. The parents were seen circling the nest tree, and the adults and eaglets vocalized back and forth several times. 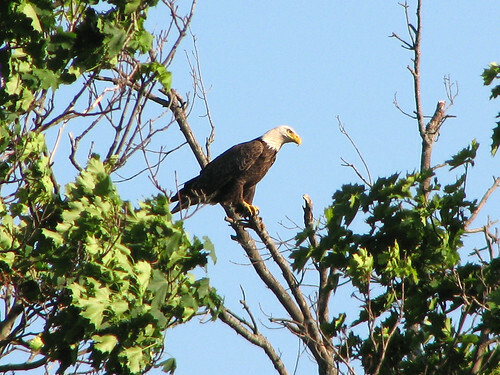 As we left, adult eagles were perched in branches very close to the nest. The next step was to observe the nest in the coming days to confirm the success of the mission. It was an extremely long, exhausting and rewarding day. The story of the Mooseheart eaglets doesn’t end here, though. Stay tuned for more to this story! 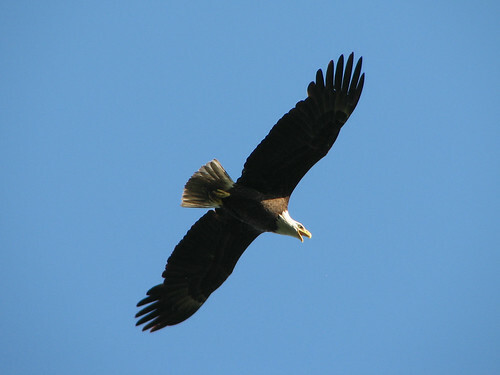 On Tuesday, May 31st, Arthur and I had the most amazing adventure, thanks to Flint Creek Wildlife Rehabilitation and a family of Bald Eagles in need. At about 6:30 in the morning we received a text message from FCWR director Dawn asking if we could help with a Bald Eaglet nest replacement. Um, YES WE CAN! Soon we were on our way to Barrington, the first stop on the way to help reunite two baby eagles with their parents in Mooseheart, Illinois. 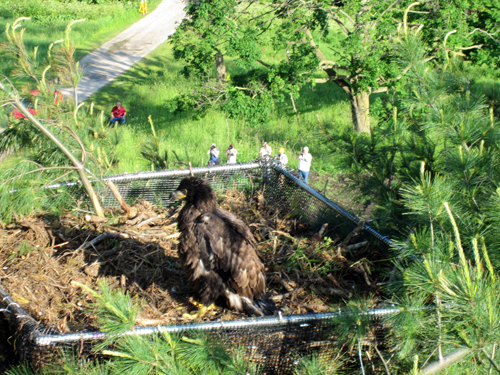 Kane County’s only nesting pair of Bald Eagles returned this year to their Mooseheart nest, first built in 2009, to raise two eaglets. Heavy storms along with excessive rain hit the area earlier in the week; it is believed the nest may have fallen on the night of Sunday, May 29th. 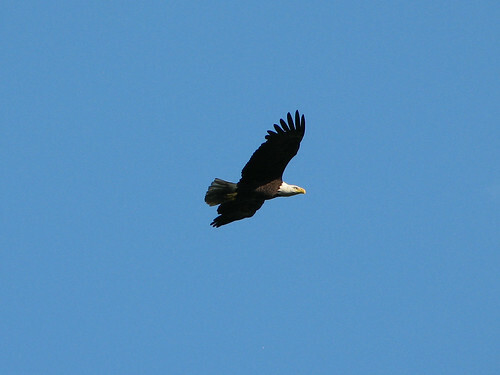 FCWR got the call of an eagle’s nest on the ground and went out to retrieve the babies late Monday night. After the babies were examined and found to be healthy, the race was on to reunite them with their parents. The first part of this plan involved volunteers Kim, Arthur and me transporting one of the eaglets back to the area of the nest, in an effort to keep the parents on site while a new nest could be constructed. We arrived at Mooseheart late Tuesday morning. 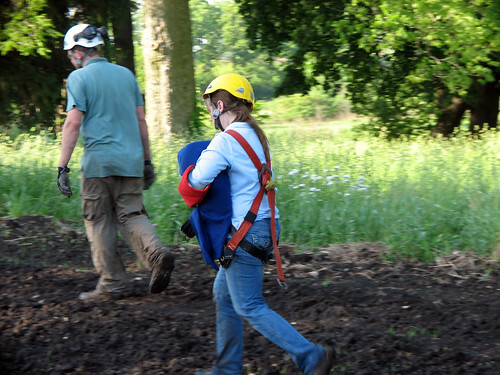 After being escorted to the nest site, Arthur and Kim walked out into a grassy area close to the downed nest and opened up the carrier holding the eaglet. They wore hard hats, thick gloves and heavy coats to protect themselves in case the adult Bald Eagles did not approve of the baby’s predicament. The baby eagle unexpectedly leaped out of the carrier but quickly settled down. 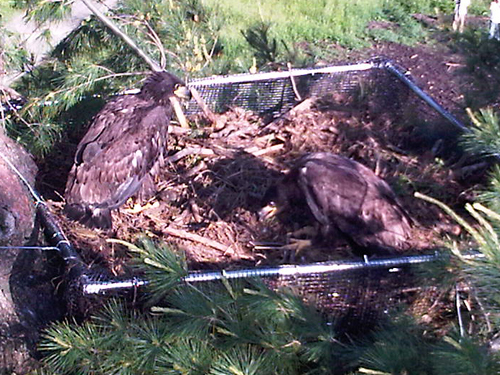 For the next few hours, we were on eaglet-sitting duty. Less than a half hour after we arrived, we were thrilled to see one of the parents fly to a nearby tree and watch the eaglet. 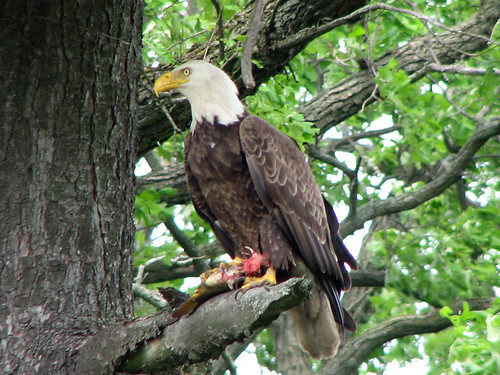 Throughout the course of the morning, we saw one or both of the adult Bald Eagles several times, sometimes with fish. Because Bald Eagles don’t feed their babies on the ground, we had to be satisfied with the parents watching the baby from afar while the rest of the nest-rebuilding project went forward. Next: A new nest for the eaglets! 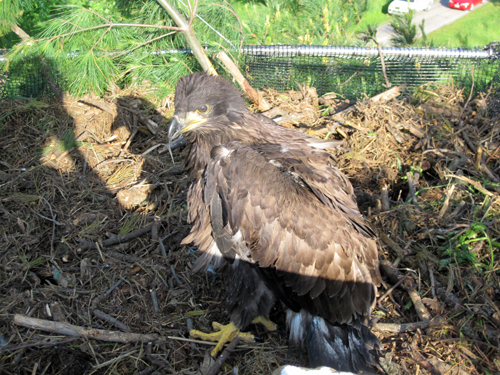 The story continues at Mooseheart eaglet rescue part 2. 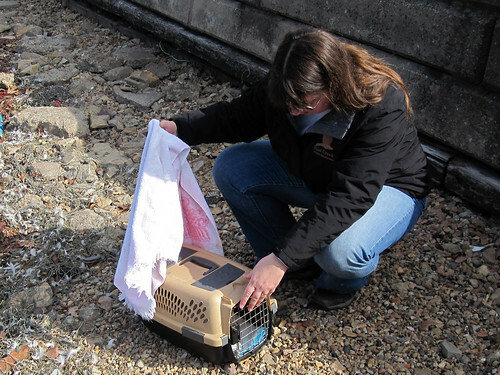 In late March Arthur and I were asked to release three birds after rehab with Flint Creek Wildlife Rehabilitation. A Cooper’s Hawk that was hit by a car in Chicago needed to be released close to where she was first recovered, and a pair of Mallards were to be released at a site Long Grove. We picked up the birds at the FCWR Itasca facility in the morning, and placed the carefully labeled boxes in the back of our car. First we released the Cooper’s Hawk. With these birds, I learned that you typically just have to open the carrier and they’re gone in a flash. This big girl was no exception. 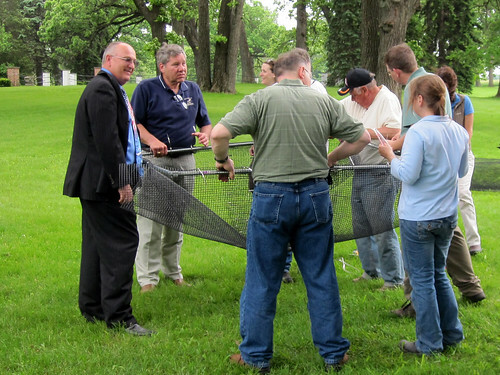 Next we traveled to Long Grove to release the two Mallards. 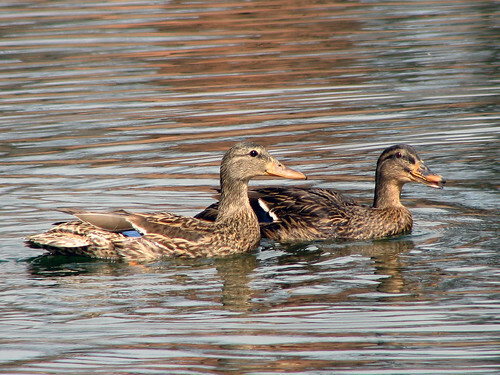 These were both eager to be on their way, too, although once they were in the water they seemed a lot more relaxed. It took us a few moments to release the second duck after the first, but as soon as we did, the first duck swam right over to join his friend. With the birds released, we found we had some time to spare before our next appointment. We checked the Illinois birding listserv, IBET, using our iPhone. 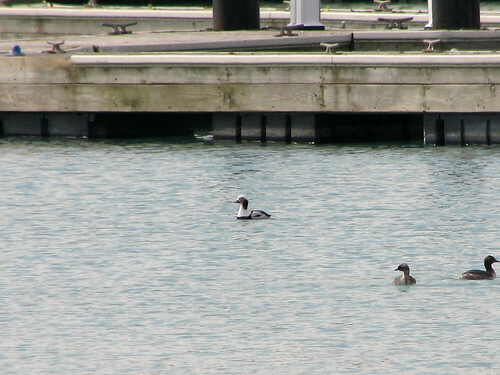 We learned that a Surf Scoter, first reported the day before, had been refound earlier in the afternoon in Mundelein. That wasn’t too much of a detour between Long Grove and our next destination so we headed over to St. Mary’s Lake in search of the scoter. We found the bird and had some nice looks (despite the lousy photo below). 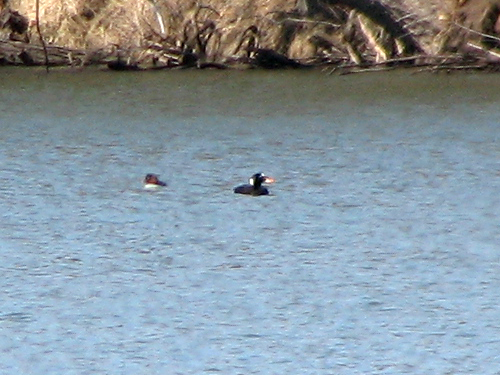 The Surf Scoter was a life bird for both of us. This was a couple of weeks after we released a pair of birds at Burnham Harbor and found our lifer Long-tailed Duck at the same time. 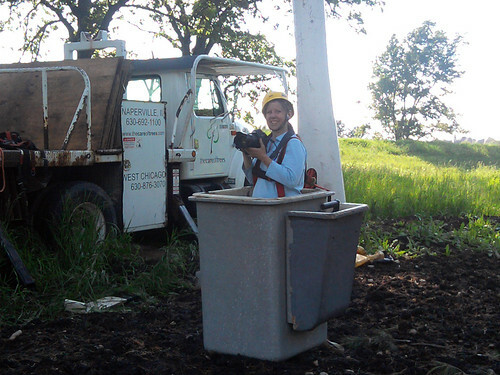 I wonder what we’ll find next time we release rehabbed birds?! 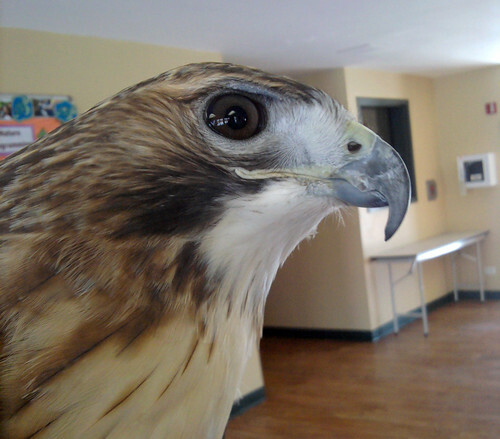 Flint Creek Wildlife Rehabilitation is a non-profit, federally licensed rehab organization with locations in Chicago, Itasca and Barrington, Illinois. You can follow their blog here, follow them on Facebook here, and make donations online here. Last month Arthur and I were asked to release a couple of birds after they were rehabbed by Flint Creek Wildlife Rehabilitation. 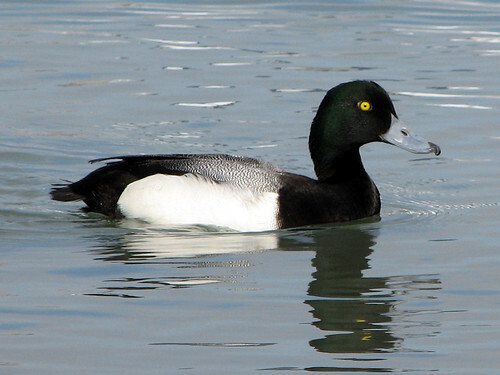 It was a lovely Sunday morning when we drove out to the northwest suburbs to pick up the birds, a Lesser Scaup and an American Coot. 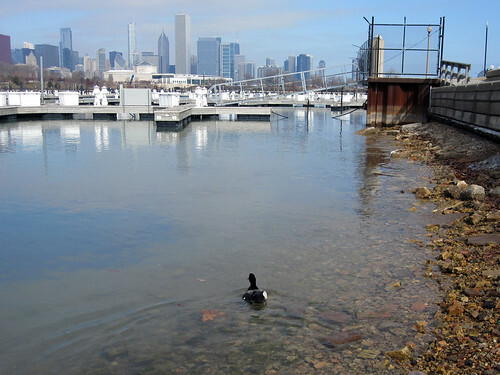 We packed up the carriers and headed to the release site, Burnham Harbor in Chicago. The ride was uneventful until a couple of drivers in neighboring cars on the Kennedy indicated to us that we had a flat tire. We pulled off at the closest service station and were shocked to find the rear passenger tire completely flat. How could we not have felt that?! 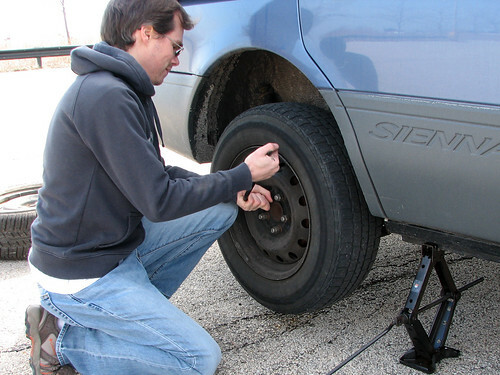 To avoid disturbing the birds too much, we elected to try filling up the tire and see if it would hold, rather than tearing up the back of our minivan in order to get the spare and tools out. Luckily the tire held… for the next ten minutes or so. Again we limped into a service station and filled the tire. 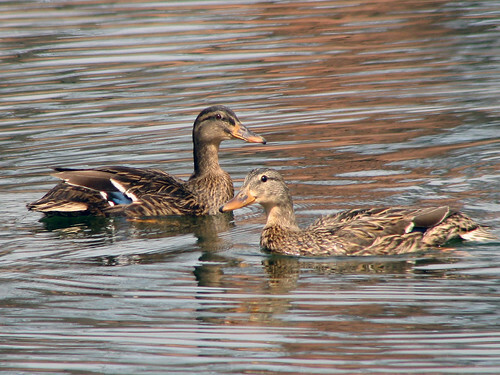 We ended up stopping once more before finally rolling into Burnham Harbor with our fowl friends none the wiser. The coot in particular was raring to go and was off flying as soon as I opened the carrier. Unfortunately we were a bit flabbergasted at the coot’s sudden departure; we aimed to document the release but only managed this photo immediately prior to the coot’s strong flight the hell away from us. There’s a coot in there, really! 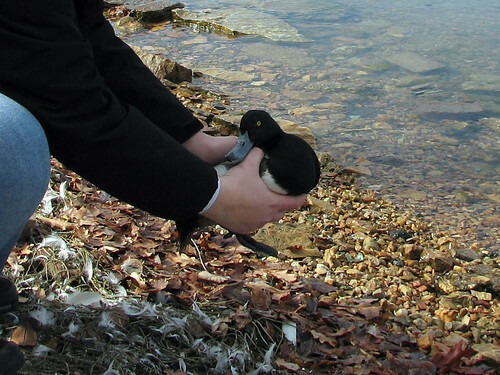 The scaup release was a bit more typical. I opened the carrier and the duck retreated to the back of the container. I gently lifted him out and placed him before the water. After a booty shake he was happily paddling in the water, not in any particular hurry at all but apparently delighted to be swimming free once again. With the birds safely released, the next order of business was changing the flat. 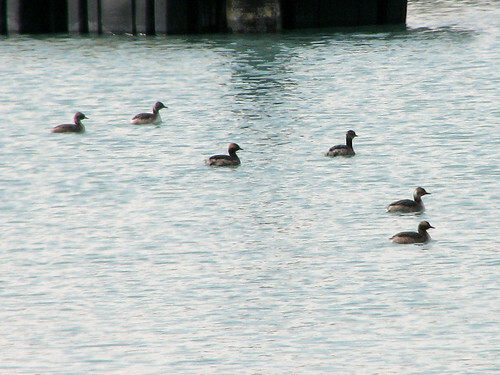 There was also a group of eight Horned Grebe, which was the most I’d ever seen at once. Today, a very special hawk made his first public appearance as an education bird with Flint Creek Wildlife Rehabilitation. 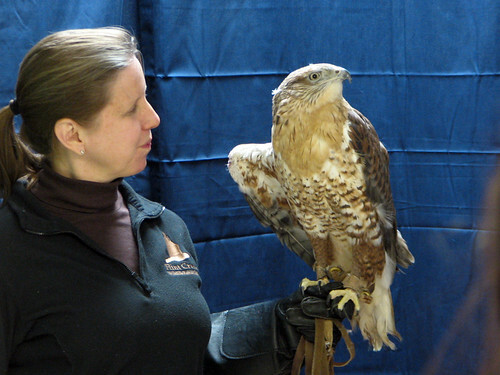 Veteran education birds were part of the FCWR display at Northerly Island’s Polar Adventure Days today, but for about a half hour, a Ferruginous Hawk named Journey was the star of the show. Journey was discovered in the plow of a train at a Chicago train yard in the fall of 2009. A western North American species, the hawk is thought to have collided with the train somewhere in western Canada! It is estimated that Journey was stuck in the train plow, in a painfully awkward position, for at least 1400 miles. The hawk was carefully removed from the train plow and began a long and difficult recovery, from injuries including a badly dislocated shoulder and severe head trauma. Nursed back to health but left with a permanent wing injury, Journey has been in training in order to join the FCWR education program. Today was his official public debut, and he was an absolute STAR! The Polar Adventure Days crowd was large and loud, so Journey and handler Dawn stood just behind an open door inside a small, safe space, with an adoring crowd able to take photos and admire the beautiful western raptor. Despite being new to the program, the young bird was a champ during the short viewing and even roused* twice! I want to let my readers know about a couple of interesting local events that are coming up. One is this week and the other is in March. 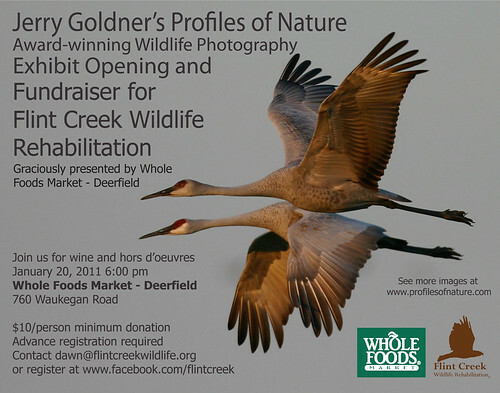 Local photographer Jerry Goldner will be having a photo exhibit at the Whole Foods in Deerfield. The event, which takes place on Thursday, January 20th from 6pm to 9pm, benefits Flint Creek Wildlife Rehabilitation. The exhibit of Jerry’s fine wildlife photography will include wine and snacks provided by Whole Foods. 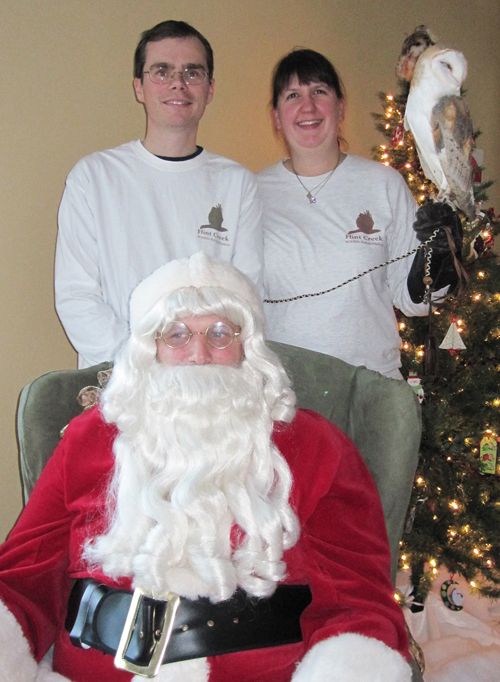 Education birds from Flint Creek Wildlife Rehabilitation will also be in attendance. UPDATE 20-JAN-11: Due to predicted extreme cold & windchill, education birds will not be in attendance at this event. The photo exhibit will take place as scheduled. A $10 minimum donation is requested for this event. RSVP on the FCWR Facebook page or by contacting FCWR directly. 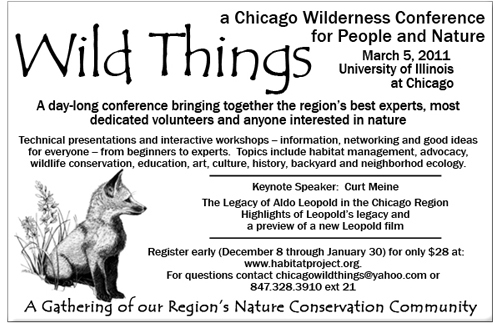 Wild Things will feature the region’s best conservationists in a variety of large and small-group sessions drawn from real-life experiences with everything from the nitty gritty of habitat management, botany, and zoology to advocacy, education, art, culture, history and back yard and neighborhood ecology. This will be a great day for anyone who likes nature, conservation, gardening, restoration or who cares about the environment. The day will kick off with a keynote speech by Curt Meine: “The Legacy of Aldo Leopold in the Chicago Region.” Six breakout sessions follow, with 10 or more different choices for each session. A variety of topics are covered, from community gardening to land stewardship to effective environmental lobbying. 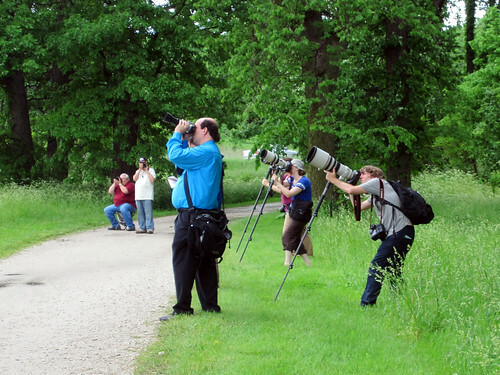 There are plenty of sessions to keep keen birders interested. I’ll be attending “Breeding Birds of Midewin National Tallgrass Prairie,” “Why do yellow-breasted chats sing at night?,” and others. Register for the conference by the early bird deadline (the reason for this early blog post) of January 30th and pay just $28 per attendee. After that, the regular registration fee is $40. The conference will take place at the Student Center East at the U of I at Chicago. See the Wild Things website for more details. 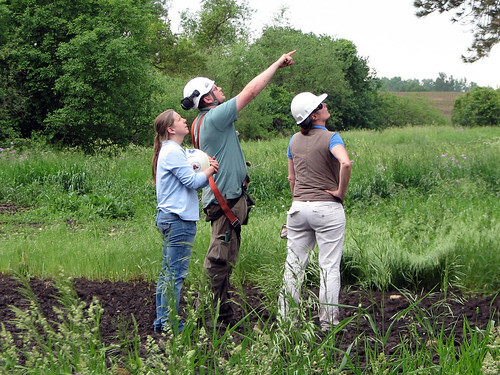 This week the new classes of raptor interns started their 12-week course with Flint Creek Wildlife Rehabilitation. I wrote about my experience on my own first day exactly one year ago: Raptor Internship Week 1. Today I helped out a bit as the Saturday group had their first class, along with my new good friend Kim. We did some (icky poo) cleaning up after showing the interns six of FCWR’s education birds. 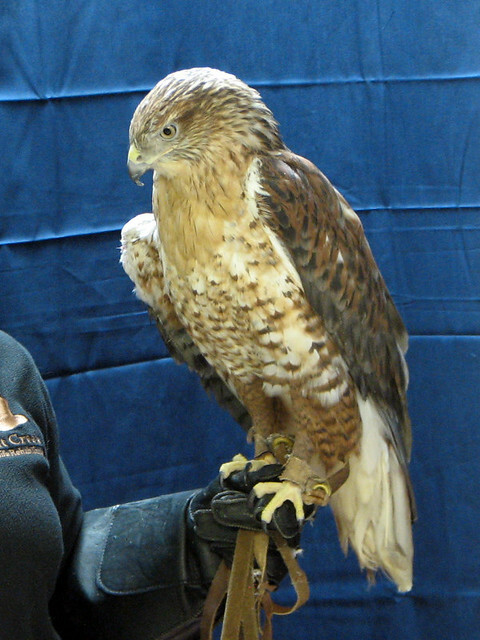 I handled spry 0511 (Red-tailed Hawk), lovely large lady Pennsylvania (Great Horned Owl) shortly, and the distinguished senior Darwin (American Kestrel). While I was waiting to “go on” with 0511 and Darwin, I waited in another room and took the chance to snap a few pictures with my Android phone. 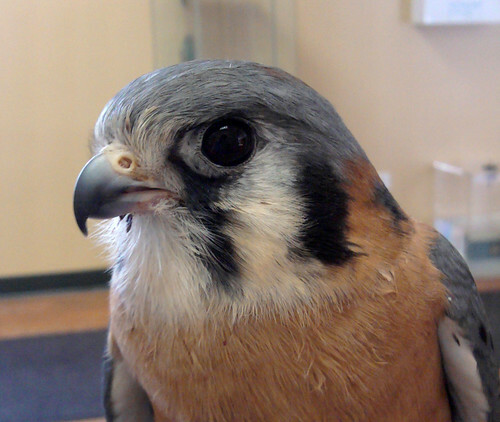 Check out this extremely cool plumage adaptation in American Kestrels – a false face! As Darwin is looking the other way you can see his extra pair of “eyes” on the back of his head. The illusion of a face is even aided by the beak-shaped dark triangle in between the eyes. Pretty neat, right? This plumage adaptation is found in other bird species, too. 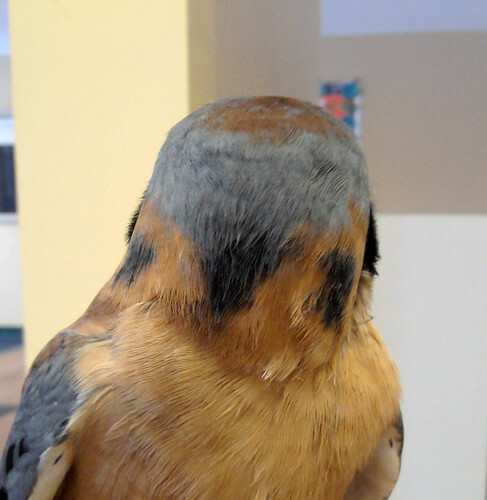 Mr. David Sibley writes more about false faces in birds here and here. Earlier this month, the Barn Owl was named Audubon California’s 2010 Bird of the Year by popular vote. Although not one of the six birds nominated by group, the Barn Owl won as a write-in candidate with nearly 70% of the total vote. The species probably got a boost via an extremely popular Barn Owl nest cam that ran over the spring. Molly the Owl got worldwide attention. The Barn Owl is doing relatively well in California; local populations suffer from habitat loss. The species is endangered here in Illinois for the same reasons. Meanwhile, Dutch bird research partners including the Dutch branch of BirdLife International named 2011 the Year of the Barn Swallow. The population of Barn Swallows in the Netherlands has been cut in half over the past 40 years. Researchers are asking for the public’s help in reporting Barn Swallow sightings as well as previous and potential nest sites. Dutch friends can visit this site to learn more. While I can’t predict what my bird of the year for 2011 will be, I can say that 2010 was the year of the Barred Owl. 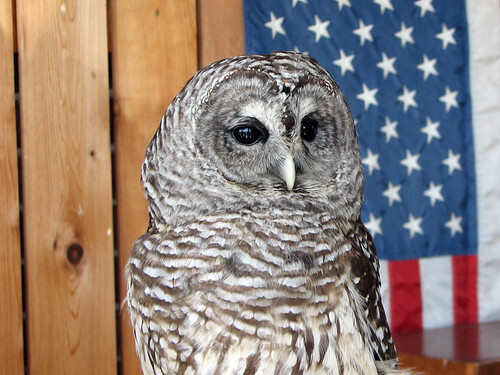 I got to meet a very special education Barred Owl named Meepy, and I am looking forward to spending more time with her in 2011. And one of my most exciting bird sightings of the year took place on November 13th, when Arthur and I attended an Owl Prowl at Ryerson Woods in Lake County and saw our first Illinois Barred Owl! 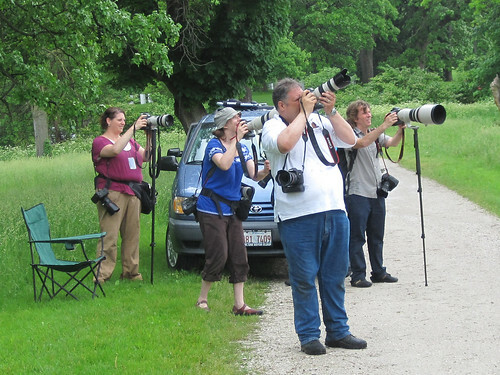 The owl was a lifer for many on the trip and a county tick for everyone except the trip leader (I think), including a friend who has been birding in Lake County for over 40 years. It was so exciting and I regret that I didn’t blog about it at the time (because I didn’t have any photos to share).